process. It re-balances the body by removing negative ions in the lymphatic system, thus creating renewed energy and a greater feeling of health and wellbeing. The client remains clothed during the treatment and sits in a chair with shoes and socks removed. 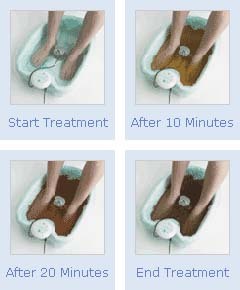 The relaxing 30 minute treatment then involves placing your feet into a spa bowl filled with warm salted water. An Energizing Cartridge creates a flow of electrons and a bio-energetic field that provides a relaxing and enjoyable treatment. The feet have an amazing 2000 pores in each foot and therefore offer one of the best points to administer the treatment, which is both efficient and convenient.